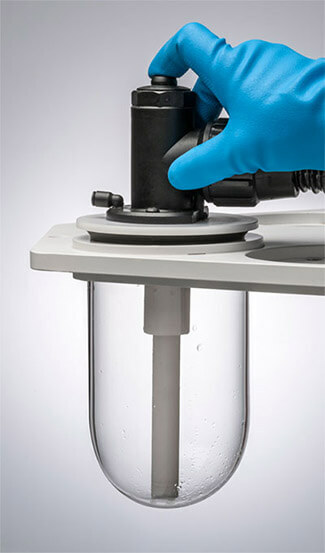 Thanks to its unique patented cleaning method the DVC-24 dissolution vessel washer cleans perfectly dissolution vessels. It is based on the power of water steam as cleaning agent by sprying steam symmetrically to the inner of the dissolution vessel wall after completely and fast removing of the used dissoluton media. The universal head cover assembly of this unique dissolution vessel washer ensures compatibility for all USP dissolution vessels while preventing steam leakage and waste back flush. Used Dissolution Media is first completely removed from dissolution vessel by vacuum. Dissolution vessels are perfectly cleaned-up by spraying water steam symmetrically to the inner of the dissolution vessel wall. Extra vacuum force is applied to remove cleaning agent and drying vessel. This operation is easily done by placing the universal head cover assembly on top of dissolution vessel and holding the operation button. The dissolution vessel washer has safety features built in, in case something goes wrong. An emergency button on front of the instrument is available. An Universal head cover exclusive design ensures compatibility for all USP dissolutions vessels (evt 2liter) while preventing steam leakage and waste back flush. The Dissolution Vessel washer is made by Gloss Technologies.